As during most droughts, discussions of how to allocate dwindling water supplies have intensified across California. One stirring piece of the debate has pivoted around using water to produce food that is exported outside of California. “Why should homeowners stop watering their lawns when farmers are using far larger amounts of precious water to grow alfalfa for China,” the argument goes. This export of “virtual water,” as it’s often called, essentially means sending water out of the state. There are data to support this. 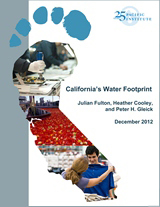 Our 2012 study on California’s water footprint found that half of the water consumed in California goes to produce things the state exports. That’s 19 million acre feet of virtual water exported each year. This trend has raised eyebrows with some western water analysts and chapped the hides of livestock ranchers whose desiccated pastures have forced them to buy feed on the open market, which is tilted in favor of exporting to places like Japan and the United Arab Emirates rather than elsewhere in California (a recent BBC story covered this). But there is another side of the trade equation. In a recent blog post, UC Davis Professor Jay Lund correctly points out that people taking issue with California’s precious water being devoted to exports should really be taking a closer look at the balance with imports. In fact, our 2012 study found that California imports more than twice as much virtual water as it exports. All the water required to make the food, clothing, electronics, and other products we import amounts to more than 44 million acre feet. That’s more water than would flow unimpaired down all the state’s major rivers in a year, more water than would fill all the state’s reservoirs. (Stay tuned for a new, more comprehensive analysis that examines how California’s virtual water imports and exports have changed over time). So California is a net virtual water importer. But before we call the debate settled, let’s think more broadly about what it has to do with the drought and future water policy for California. California’s use of virtual water imports means that the state is far more dependent on water resources outside of the state’s borders, and this water is increasingly important to residents’ well-being and the state’s growth. So in many ways, virtual water explains California’s resilience to the effects of the current drought. This year there will be far less water to go around the state, and the agricultural sector, people, and ecosystems will certainly register the effects. But there will still be food on the supermarket shelves, and the statewide economy will register only a minor shock. The flip side of this resilience is that California is potentially vulnerable to extreme hydrologic conditions and management decisions outside of our borders and jurisdiction. Some of these places may be awash in water while others face varying degrees of scarcity, contamination, or mismanagement. For example, the Great Plains droughts of 2011and 2012 notably affected grain imports to California, reflecting – to varying degrees – the ways farmers responded by pumping fossil groundwater from the Ogallala Aquifer. Response was considered relatively successful in Kansas, where new groundwater policy was enacted, whereas northern Texas saw Ogallala levels drop nearly three feet. In short, California has become increasingly reliant on products grown in places like these, so whether we like it or not, our sustenance and economy is partly dependent on their water systems. As more and more regions around the world face water woes of their own (see for example Circle of Blue’s “Chokepoint” series), California cannot afford to only worry about sustainable management in its own backyard. Our population is growing, and so is our demand for a bigger piece of the global water pie. Of course water management has been, and will mostly remain, a local issue, and we have a lot to do to manage current and future scarcity. But an understanding of virtual water tells us that we live in a globalizing world where water resources are effectively shared. As our social systems adapt to climate change, understanding changing distributions of benefits, risks, and impacts to resource systems like water becomes ever more important. So what should California do? There’s no single answer, but we do know that California is a powerful state, economically and politically, and can be a leader in environmental policymaking. Virtual water research points to important unknowns and potential vulnerabilities, but hasn’t resolved them yet with enough precision. We need to push this discussion further to better understand what is at stake with virtual water for California, and what action can be taken by individuals and state agencies. In a time of drought and real water problems, it’s difficult to think about abstract concepts like virtual water. But considering the role it plays in our daily lives, the meaning of virtual water to California’s future is very real indeed.